To celebrate 50 years, CES® 2017 is poised to be bigger, bolder and more varied than ever before. With a record-breaking footprint of more than 2.6 million net square feet of exhibits, CES 2017 will feature new marketplaces, more than 850 first-time exhibitors, seven keynote addresses, expanded conference programming, additional SuperSessions and enhanced show floor services. With three main venue locations in Tech East, Tech West and Tech South and more than 24 product categories showcasing the hottest tech trends, expect to experience a whole lot of “whoa-ments” at CES 2017. Digital Money Forum, presented by Mastercard is extended from a half to full day event, and CyberSecurity Forum, presented by CyberVista and Digital Health Summit, presented by LIDT, return to CES 2017. Expanded 3-day series of Sports Business Innovation, presented by Turner Sports. Expanded Self-Driving Technology marketplace in Gold Plaza, with nine featured exhibitors including Autoliv, Clarion, Delphi, IAV, Navya, NVIDIA, NXP, Renesas and Valeo. More than 850 New Exhibitors including: Baidu Intelligent Systems, Bing (C Space), Carnival Corp., Comcast Platform Service (C Space), eBay (C Space), Formula E, Furrion, History Channel, Magneti Marelli, Nissan, Suning, Swagtron, Time (C Space), Twitter (C Space), Xiaomi. CES 2017 Pandora station – “WHOA” 50 Years of CES will capture the energy and excitement of the past 50 years with music from artists like Sia, Styx and Drake. C Space Storyteller Sessions – Beginning January 9, Spotify will feature 30 minute sessions. From mobile to VR to video and digital content, influencers and newsmakers share stories, best practices and case studies about the unique relationships between brands, entertainment and technology. New CES app with directional navigation and networking opportunities. Get instant conference information with the new CES Twitter Guide, powered by conversational intelligence platform Conversable. Direct Message with @CES to see top hashtags, company booth and event locations, speaker schedules and answers to FAQs. CES will be conducting Facebook Live and Periscope interviews, streams from the show floor, keynotes and more during the show. Tune in at Facebook.com/CES and Twitter.com/CES. Seven inspiring keynotes addresses, with five first-time keynoting companies, including Carnival, Under Armour and Nissan. Partner events including the Smart Cities Hackathon presented by Amazon Alexa, Go Behind the Scenes with Microsoft Surface lunch and learn, C Space Party presented by JEWEL Nightclub, Signature Luncheon presented by Women in Cable Telecommunications, and Mobile Munchies: “Late Night Eats” with Watson + Weather. Four new Conference Tracks covering printed electronics, IoT, data privacy & smart systems. 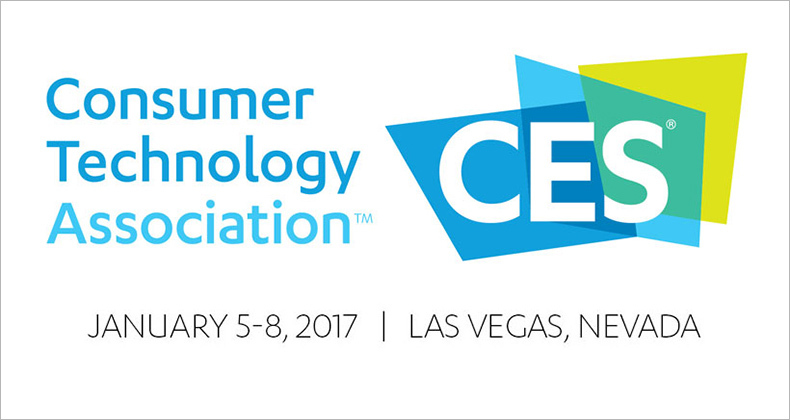 CTA Analysts: Looking at CES 2017 and Tech Trends Lunch Roundtable (Friday, January 6 from 12:45-1:15 PM, LVCC S229). Open to media only. CES 50th Anniversary Celebrations – Join us at Tech East and Tech West for celebrations recognizing 50 years of show floor excitement at CES.